The IALLJ is honoured to announce Matteo Avogaro (Ph.D. Researcher, University of Milan, Italy) as winner of the 2018 Marco Biagi Award with his paper “New perspectives for workers’ organizations in a changing technological and societal environment”. This entry was posted in Marco Biagi Award on August 26, 2016 by Jeff Priest. To stimulate scholarly activity and broaden academic interest in comparative labour and employment law, the International Association of Labour Law Journals announces a Call for Papers for the 2018 Marco Biagi Award. The award is named in honor of the late Marco Biagi, a distinguished labour lawyer, victim of terrorism because of his commitment to civil rights, and one of the founders of the Association. The Call is addressed to doctoral students, advanced professional students, and academic researchers in the early stage of their careers (that is, with no more than three years of post-doctoral or teaching experience). The Call requests papers concerning comparative and/or international labour or employment law and employment relations, broadly conceived. Research of an empirical nature within the Call’s purview is most welcome. Submissions will be evaluated by an academic jury to be appointed by the Association. Submitted papers should include an abstract. The paper chosen as the winner of the award will be assured publication in a member journal, subject to any revisions requested by that journal. Papers may be submitted preferably in English, but papers in French or Spanish will also be accepted. The maximum length is in the range of 12,500 words, including footnotes and appendices. Substantially longer papers will not be considered. The author or authors of the paper chosen as the winner of the award will be invited to present the work at the Association’s 2018 meeting which is to be announced soon on the website of the Association. Efforts are being undertaken to provide an honarium and travel expenses for the presentation of the paper. Until that effort bears fruit, however, the Association hopes that home institutional funds would be available to support the researcher’s presentation. 2015 Uladzislau Belavusau (Vrije Universiteit Amsterdam, the Netherlands), A Penalty Card for Homophobia from EU Labor Law: Comment on Asociaţia ACCEPT (C-81/12). This entry was posted in Marco Biagi Award on June 9, 2016 by Jeff Priest. The 2014, 2013, and 2012 Overview are still available online. This entry was posted in Featured on April 27, 2016 by Jeff Priest. 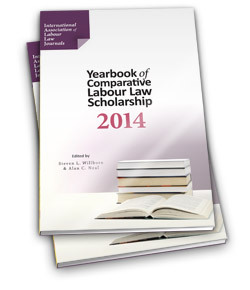 The International Association of Labour Law Journals (IALLJ) is delighted to announce the publication of the Yearbook of Comparative Labour Law Scholarship 2014. A collaborative project of the IALLJ and the International Society for Labour and Social Security Law (ISLSSL), the Yearbook will bring to a wider audience some of the best in recent labour and employment law scholarship from around the world. This edition of the Yearbook — offered in both softcover and e-book formats — is the inaugural volume in an anticipated series. For more information, or to purchase the Yearbook, please visit the Lancaster House online bookstore. To download a two-page brochure, click here. This entry was posted in IALLJ Yearbook on April 22, 2015 by Jeff Priest. This entry was posted in Featured on April 10, 2015 by Jeff Priest. To stimulate scholarly activity and broaden academic interest in comparative labour and employment law, the International Association of Labour Law Journals announces a Call for Papers for the 2015 Marco Biagi Award. The award is named in honor of the late Marco Biagi, a distinguished labour lawyer, victim of terrorism because of his commitment to civil rights, and one of the founders of the Association. The Call is addressed to doctoral students, advanced professional students, and academic researchers in the early stage of their careers (that is, with no more than three years of post-doctoral or teaching experience). Submissions will be evaluated by an academic jury to be appointed by the Association. Papers may be submitted preferably in English, but papers in French or Spanish will also be accepted. The maximum length is 12,500 words, including footnotes and appendices. Longer papers will not be considered. The author or authors of the paper chosen as the winner of the award will be invited to present the work at the Association’s 2015 meeting in Leuven, Belgium, on June 24, 2015. Efforts are being undertaken to provide an honarium and travel expenses for the presentation of the paper. Until that effort bears fruit, however, the Association hopes that home institutional funds would be available to support the researcher’s presentation. The deadline for submission is March 31, 2015. 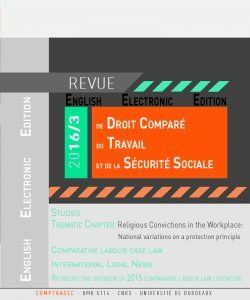 Submissions should be sent electronically in Microsoft Word to both Lavoro e diritto at lavoroediritto@unife.it and the Comparative Labor Law & Policy Journal at willborn@unl.edu. This entry was posted in Marco Biagi Award on October 30, 2014 by Jeff Priest. This entry was posted in Featured on April 9, 2014 by Jeff Priest. 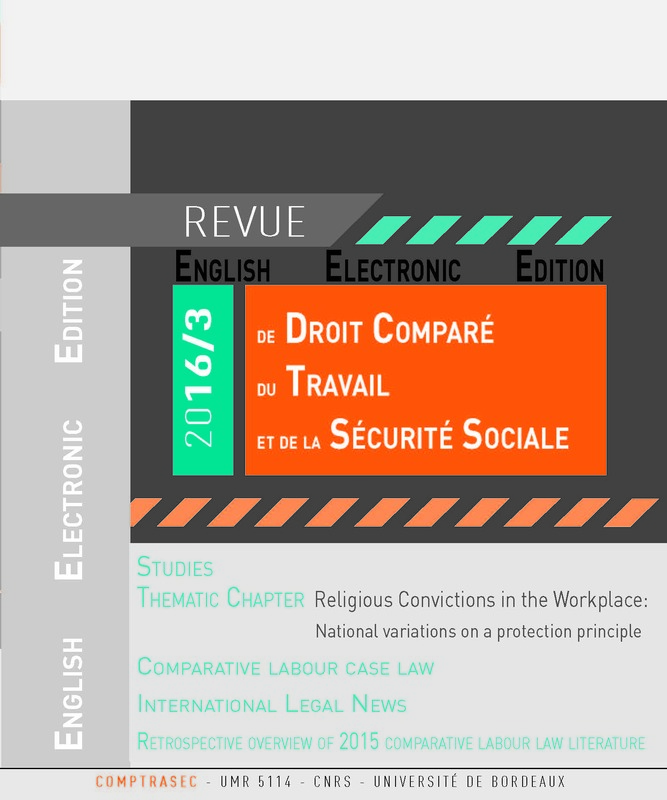 I am pleased to welcome you to the new website for the International Association of Labour Law Journals. The Association is a vibrant and growing group. At its most recent meeting in Bordeaux in June, 2013, the Association voted to admit Rivista Giuridica del Lavoro e della Previdenza Sociale from Italy as its 24th member. The minutes of the Bordeaux meeting will soon be online. Each year, to stimulate scholarly activity and broaden academic interest in comparative labour and employment law, the Association selects a paper by a young scholar as the winner of the Marco Biagi Award. The award is named in honor of the late Marco Biagi, a distinguished labour lawyer, victim of terrorism because of his commitment to civil rights, and one of the founders of the Association. Please publish and circulate the Call for Papers for the 2014 Marco Biagi Award as widely as possible. The next meeting of the Association will be in Dublin, Ireland, in mid-September, 2014. It will be held in conjunction with the XI European Regional Conference of the International Association of Labour and Social Security Law. The Association is very pleased to unveil this new website. We extend thanks to Lancaster House and Jeffrey Sack for all of their hard work in constructing it. This entry was posted in Uncategorized on September 3, 2013 by Jeff Priest. 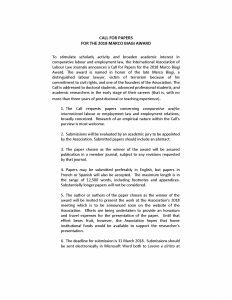 To stimulate scholarly activity and broaden academic interest in comparative labour and employment law, the International Association of Labour Law Journals announces a Call for Papers for the 2014 Marco Biagi Award. The award is named in honor of the late Marco Biagi, a distinguished labour lawyer, victim of terrorism because of his commitment to civil rights, and one of the founders of the Association. The Call is addressed to doctoral students, advanced professional students, and academic researchers in the early stage of their careers. Papers accepted by the jury will be assured publication in a member journal. Papers may be submitted preferably in English, but papers in French, or Spanish will also be accepted. The final version should not significantly exceed 50,000 characters which is about twenty printed pages. The author or authors of the papers selected by the jury will be invited to present the work at the Association’s 2014 meeting in Dublin. Efforts are being undertaken to attach an honorarium and travel expenses for the presentation of the paper. Until that effort bears fruit, however, the Association hopes that home institutional funds would be available to support the researcher’s presentation. electronically to both Lavoro e diritto at lavoroediritto@unife.it and the Comparative Labor Law & Policy Journal at willborn@unl.edu. This entry was posted in Marco Biagi Award on September 3, 2013 by Jeff Priest. The winner of the 2013 Marco Biagi Award is Aline Van Bever (University of Leuven) for a paper entitled, The Fiduciary Nature of the Employment Relationship. This paper explores the circumstances under which an employment relationship may entail fiduciary duties. Recognizing that the employment relationship is both relational and embedded within a complex framework of explicit and implicit norms, the paper explores English, American, Canadian, and Australian law to determine when employees owe specific duties of loyalty to their employer. Click here to read the full announcement. This entry was posted in Marco Biagi Award on May 9, 2013 by Jeff Priest.